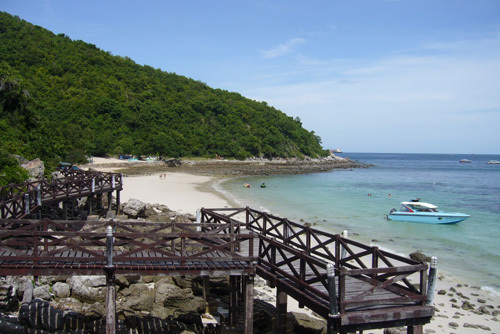 Coral Island Tours (also known as Koh Larn) in Pattaya Beach, Thailand. Book Online to enjoy this beautiful tour to the island! The trip to Coral Island commences with the pickup from your hotel. And then transfer by boat to the Coral Island (Koh Larn) where you can enjoy swimming, diving, snorkling, para-gliding, skiing or just a perfect relaxing sunbath. Hot and delicious seafood or vegetarian (the choice is yours) lunch is also served in the afternoon. The departure time for the trip is 9:00 a.m. and returning time is at 5:00 p.m. The trip is priced at THB 500 including lunch and roundtrip transport.